Mike Brothers is one of my advanced students. 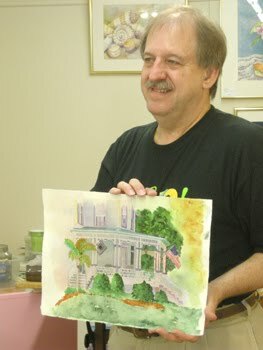 He recently painted this piece of a local bed and breakfast called The Pineapple House. The house is just around the corner from our gallery and teaching studio. Mike used a wet-in-wet wash for the initial underpainting on this piece. Then he worked in the details. The wet wash makes the light on the building glow like early morning sunlight!